Our family home has been destroyed and we are left houseless due to a natural disaster. Please help us relocate, recover and rebuild. We have lost everything due to the storm. We are devastated at the loss of our family home, but we are hopeful that we can rebuild. A powerful monsoon storm blowing through the Valley of the Sun on Tuesday July 9th has destroyed our family home of 75 years. The powerful winds uprooted our 150 foot pine tree which came crashing down into the house, caving in the roof and trapping our elderly and disabled mother, Ellen Oso. She has sustained minor injuries and is now in the hospital being treated. Three other family members were also in the home when the roof caved in. We will need a lot of help to recover, as many belongings were destroyed by the storm, the home has been nearly totally destroyed. The house was home for seven of members of our family, all sharing duties caregiving for my mom who became disabled in 2009 due to a debilitating stroke. Emergency Relocation Funds (ASAP) - Temporary Housing - We need emergency funds to support temporary housing to relocate while the building is assessed. We estimate about $5,000 for these expenses. 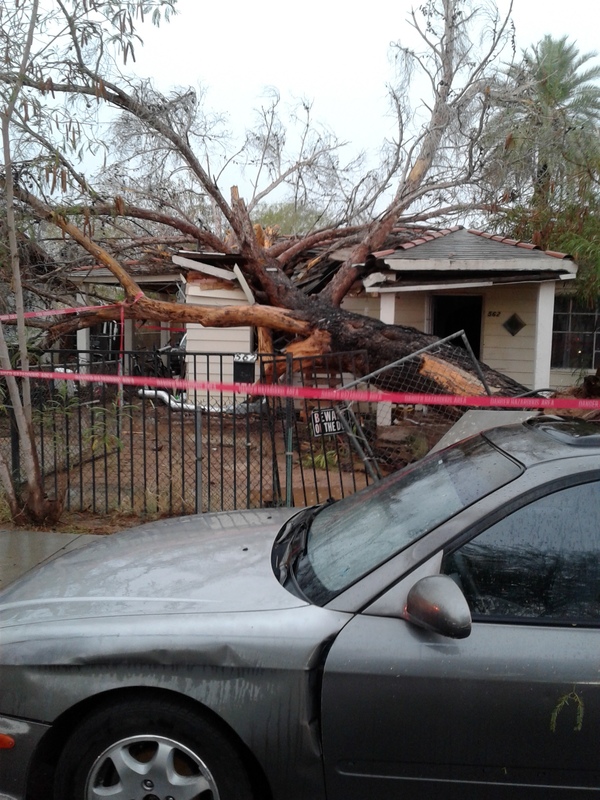 Recovery/Rebuild Funds (2-3 months) - According to initial reports from City of Mesa officials, the home may be a total loss and need to be demolished and rebuilt. We need support to rebuild a family home that is safe, secure and ADA compliant. Estimated costs- $150,000. Other Ways to Help - In-Kind support of building supplies, furniture, new clothing, etc. We can use volunteer support to find resources and help with rebuilding efforts, once it is time. Please contact us if you are interested in helping us to rebuild. We appreciate prayers of encouragement and support.